Calling all leaf peepers out there! Autumn is here and travel plans lie in wait. The Great Smoky Mountains National Park spans over 800 square miles, straddling the border between North Carolina and Tennessee in the United States. It is one of the most pristine locations in the country for a thoroughly colorful fall experience. There are many ways to explore this gorgeous landscape — a road trip over the 384 miles of road offers unforgettable panoramic vistas of hardwood forests stretching to the horizon, and bubbling mountain streams. Among the popular fall drives are the Clingmans Dome Road, the Blue Ridge Parkway, or the Foothills Parkway. At 6,643 feet, Clingmans Dome is the highest point in the Great Smoky Mountains and the highest point in Tennessee. The observation tower on the summit offers spectacular 360 degree views of the Smokies. Make quick stops at the scenic pullouts and feast your eyes on the ridges and valleys along the way. Ensure you prepare for cooler temperatures at the dome, be sure to bring a jacket. The Blue Ridge Parkway connects Great Smoky Mountains National Park to the south and Shenandoah National Park on the northern end, and offers many scenic vistas and cultural pit stops in the local communities. Enjoy the local flavor — a perfect travel experience in the great outdoors! The secret to the extraordinary fall colors in the Smokies? The park’s amazing diversity of trees — about a 100 species of native trees live in the park, the majority of them deciduous. For a more sustainable exploration of the Smokies, get on your bike. The Cades Cove Loop Road, an 11-mile one way road, is the most popular in the park for a biking tour, with excellent opportunities for wildlife viewing and touring 19th century homesites. Bicycles may be rented at the campground store (located near Cades Cove Campground). The loop road is closed to vehicles until 10 a.m. every Saturday and Wednesday morning from May until late September to allow bicyclists and pedestrians to enjoy the cove. Hike the trails to Grotto, Laurel, Abrams and Rainbow — some of the best waterfalls in the park. With abundant rainfall and elevation, waterfalls are the Great Smokies’ most magnificent offerings. Don’t forget to check the trail map for trails across the park. With options for backcountry camping, developed campgrounds, and group campsites available, travelers can check the facilities and make reservations. For wildlife lovers, Cades Cove is the place to be. A sprawling valley surrounded by mountains, it is one of the most popular destinations in the park. Large numbers of white-tailed deer are frequently seen, and sightings of black bear, coyote, ground hog, and other animals are likely. So head on to the Great Smokies for a fall weekend, an eco travel experience you won’t forget. 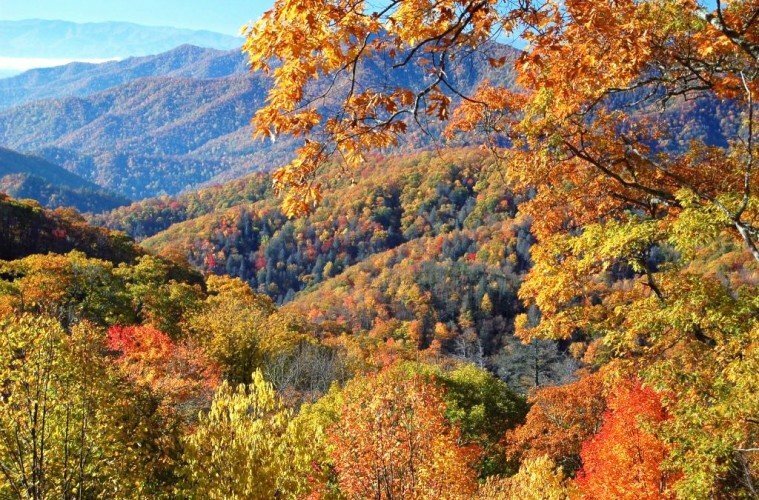 The Great Smoky Mountain’s main fall leaf peeping season is from mid to late October, though elevation profoundly affects when fall colors change in the park.